Our I.D. tag offers a combination of quality and value that is ideal for schools, sports teams and personal gifts. These aluminum tags are sublimatable on one side. 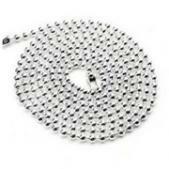 A 30" bead chain with jump ring is sold separately. Unisub Aluminum ID Dog Tag (1S) 1.15x2"
Unisub Aluminum ID Dog Tag (1S) 1.15"x2"